Need to understand student’s hearing technology and how to keep it working? 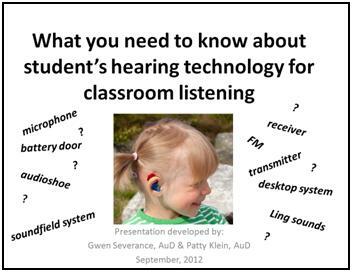 Below is a for you to use to teach/learn What you need to know about student’s hearing technology for classroom listening. You have a choice of a pdf version of this PowerPoint pdf presentation , which is easier for most systems to download or the full PowerPoint version of this presentation. This is a large file with 43 slides. Please allow 15 seconds or so to load this pdf document.